Gawd I hope Trump does this, lolz. Hey, libs are all for illegals so they should be ecstatic to have them flood their cities. Does this mean we finally get our taco trucks on every street corner? Because I'm still waiting. Well those silent conservatives won't have to worry too much about increased crime. There is no empirical evidence that immigration increases crime in the United States; indeed, the rate of incarceration of immigrants is consistently lower than that of the native born of similar ages. BTW, just so we're clear, the President, who has made immigration both legal and illegal a major cornerstone of his campaign and presidency to develop and maintain support of his base, is in favor of a program that would invite immigrants to the border and he would personally ensure they get bus ride to civilized areas in the nation that are more welcoming of immigrants. What better a magnet for increased migration than "C'mon in! Here's a ticket to Portland or somewhere!". All to own the libs. And his supporters will completely whoosh on the irony. Trump: Build the wall, close the border! Trump: Invite them here and give them a place to live where they don't force local law enforcement to do the federal government's job on illegal immigration! Supporters also love that, apparently. You know, when Trump said he could shoot someone in the middle of Fifth Avenue and not lose voters, I don't think he was exaggerating. Which is a first for him. I wouldn't move anywhere there if the house were given to me. They can move. Or possibly they will no longer be the SILENT Conservatives. This is true. However, add the word illegal immigrants and a totally different picture emerges. Thanks to a massive increase in the number of illegal immigrants crossing the border and a sharp increase in the number of family units apprehended we effectively have an open border with Mexico. Other than Mexicans illegal crossers trained to request asylum by radical US based Leftist groups are pretty much given a summons for a hearing then transported to cities like Tucson or San Antonio where local charities attempt to care for them. Of course the human traffickers posing as family units which cannot be screened out are self sufficient. The proposal to place illegal immigrants in sanctuary cities deals with people at the end of the asylum seeker scam pipeline. It doesn't increase the incentive to come to the US, illegal border crossers are already flagging down border patrol officers to take them into a process guaranteed to be rigged in favor of releasing them into the US. Instead of concentrating the burden of caring for the so-called asylum seekers on a few border states why not give pious Democrats ruling sanctuary cities the opportunity to enjoy more of the benefits they claim illegal immigrants provide? It's all great when other cities have to contend with a flood of poor, uneducated immigrants crushing local charities, the health care system and schools. 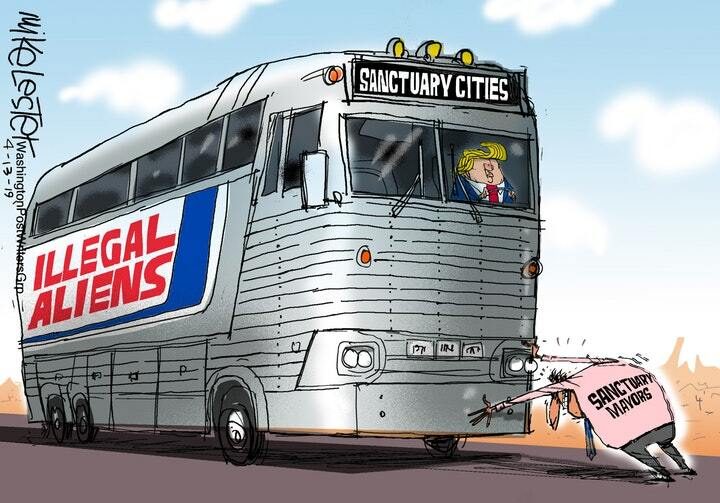 Just the prospect of the benefit of more illegal aliens arriving at the doorstep of local charities or the bus station has these so-called welcoming communities in a frenzy of condemnation, not for their sanctuary city policy but for Trump. The comment attacking Trump supporters as ignorant sheep for backing a policy proposal that would require sanctuary cities to share more equitably in the burden created by their defiance of Federal law is typical Resistance nonsense. It's all good to play to wealthy Democrats by insisting that theirs is a welcoming city to illegal immigrants but when the prospect of them actually arriving by the bus load arises well that's a different story but above all Orange man bad. Want illegals? Here ya go!